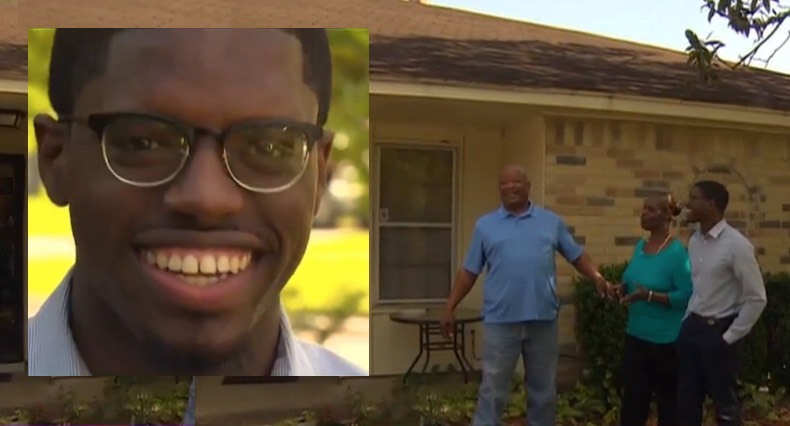 This college student secretly saved up thousands of dollars so he could give his grandparents the surprise of a lifetime. They burst into tears of joy as he presented them with an oversized check announcing he’d paid off their mortgage with $15,000. Stefun Darts could always be seen helping his mother and family around the house, but he’d kept the idea of a gift for his grandparents secret for 14 years. “I promised God in the second grade I would pay off you guys house and help you retire,” he wrote on Facebook after revealing the surprise. Cecil and Marilyn Roberts had been steadily paying off their home mortgage – every month, on time — for twenty years. But they still had four years of payments to go, until Stefun showed up and shocked them with the news of his sudden gift. The generous young man had saved so much money, that he was also able to send them on an island vacation to the Bahamas. Stefun had socked away the money while going to college, holding down a full time job, and running two non-profits in Houston, Texas. He seldom went out with friends, choosing to bank the cash instead. So eager was he to eliminate that mortgage and show gratitude to his grandparents that he practically lived on microwave pizza. For the 24-year-old, the payoff was worth every penny. Surprise Your Friends With This Generosity, Share It….